Skin on bone in whole turkey thigh seasoned with black pepper. 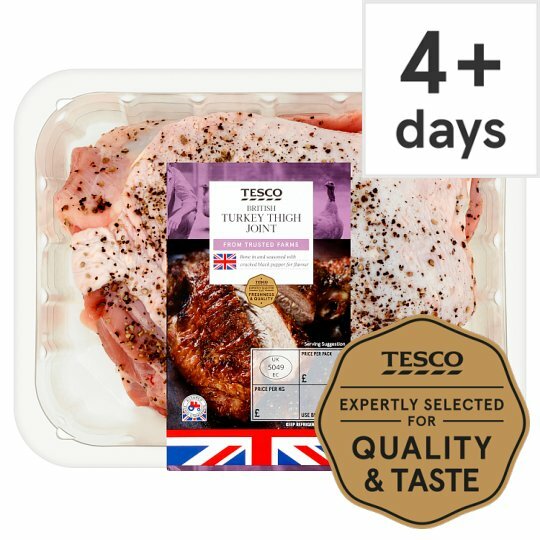 From trusted British farms: Our British turkeys are reared by selected farmers and are free to roam in spacious barns with natural daylight to ensure their wellbeing. Instructions: 180°C / Fan 160°C / Gas 4 1 hr 45 mins - 2 hrs For best results. Place turkey joint into a roasting tray and cover with kitchen foil. Place on a baking tray in the centre of a pre-heated oven for 1 hour. Remove the foil, spoon juices over the joint and continue cooking for a further 45-60 minutes. Cover with foil and allow to rest for 15 minutes before carving. Always wash hands, surfaces and utensils after contact with raw met. Defrost thoroughly for a minimum of 18 hours in a refrigerator.